We stayed in one of the condo's . Room was clean, but had a soft covered toilet seat that was ripped. Other than that, the pool was great, the cantina was very good and location on beach was quiet. Balcony view was awesome! Continuous shuttle can take you to busier parts of Cancun, but know where you want to go and how long it takes to get there. There is small store nearby. Beautiful view, great location, free parking. Nice staff, minimum English. Good restaurant on site. Good price. We liked the old Spanish decor. Nice pool. The pool area and bar/restaurant were very nice. The security guards were helpful and vigilant. We enjoyed observing the osprey from the hotel next door. The beds were very comfortable. AC and ceiling fan workd great. The excellent beach. Elecronic room safe in the closet. The sea view, sea view, sea view! You are on the beach front, first row as promised. The facility is nice, with supermarket, restaurant and pool downstairs, we really enjoyed our stay. Public bus stops at the main entrance. Hotel location is great. It is next to the beach that is clean. Water is nice and blue. It is located in a nice part of town. The view from our room was nice. We asked for a room with balcony facing the beach. It has multiple elevators. That is about all I can say about the positives. I almost forgot, parking is free, if you are driving. Friendly, nice and helpful staff, the room was spotless, the location was very convenient. I truly enjoyed both the beach and the pool, the views were amazing. I would definitely stay again if coming back to Cancun! My stay here was amazing! I had a little mix up when I was booking and they were able to find me a place to stay for the night! They were super helpful, the room was clean, the view was amazing, AND they had a whole 5 gallon jug of water! We were given a tour of the property and was shown its ammenities. Francisco gave us a few tips of where to eat and how to save money. Got our money's worth. We paid cash since we did not want to add foreign charges to card. Lock in a great price for Cancun Plaza Sea View – rated 8.1 by recent guests! 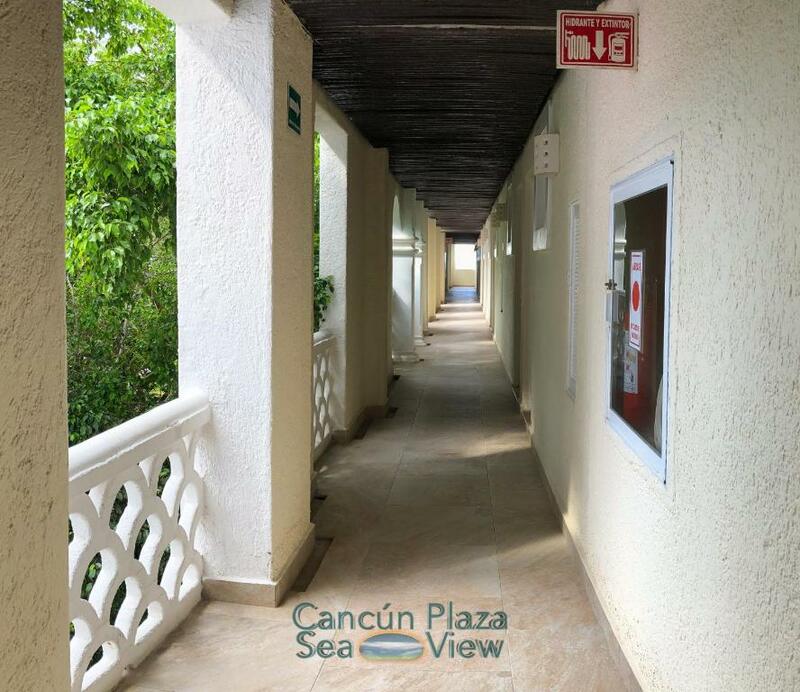 Set in Cancún, Cancun Plaza Sea View provides accommodations with seating area. Complimentary WiFi is featured. The units come with tiled floors and feature a fully equipped kitchen with a microwave, a dining area, a flat-screen TV, and a private bathroom with bath. There is also a toaster, fridge and a coffee machine. The condominium offers an outdoor pool. La Isla Shopping Mall is 4.3 mi from Cancun Plaza Sea View, while Coco Bongo is 6.2 mi from the property. Cancún International Airport is 6.2 mi away. 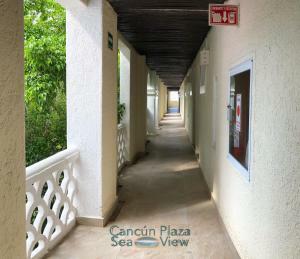 When would you like to stay at Cancun Plaza Sea View? House Rules Cancun Plaza Sea View takes special requests – add in the next step! Please tote that currently the property can't handle direct online credit card payments, but you can pay via credit card on site. Please inform Cancun Plaza Sea View of your expected arrival time in advance. You can use the Special Requests box when booking, or contact the property directly using the contact details in your confirmation. It didn't bother us but hot water takes 10 minutes to arrive. The room was run-down. Loose bathroom fixtures. Burnt out lights. No drinking water in room until we called. Only one small bar of soap. Only one wash cloth. Extra cost to rent beach towels that were no bigger than standard bath towel. Ceiling fan blades quite dusty as well as corners of room and under beds. No toaster or coffee maker despite being listed. Patio door lock busted. Room lock was electronic code, but door was loos in the jamb and would be easy to jimmy with a credit card or bent fork. Not a lot of restaurants around. Our balcony is right next to the one of our neighbor - it is too close in my view, but it did not bother us really. Unfortunately, spring breakers are frustrating. The staff and security are amazing. I didn't envy them! The view is great and the restaurant excellent value for money. There was a lot of cockroaches. The stuff put poisen in the room with all my things inside. Location was fantastic. The view are to die for. Rosi and Cindy are both sweethearts in taking care of their guests. Close to the airport as well as a few fun restaurants. Very convenient for an overnight stay in Cancun!! Good place for one or a few nights in Cancun on the beach. Balcony with sea view and first line. Personal was very helpful. Very good quality/price. Good restaurant near the pool. There was an odor coming from the sink and locked closet in bathroom area. Toilet was broken. I REALLY didn’t like the fact that electronic entry to rooms was simply the room number and # on the keypad. This means basically anyone can gain access. Terrible Wifi. Needs an ATM...restaurant only allows credit/debit cards ONE TIME during your stay (at least that’s what they said to ME),after that, you need cash! David was AWESOME!! Proximity to beaches and niceness of staff. It is a BEAUTIFUL facility overall...just needs updating and more staff maybe. There is a great SMALL convenience store attached to the property. The balcony door was hard to open and close in room 4412 but they said they would fix it. The bathroom tub had some paint that had chippend away but not a big deal for us. Over all, if we needed something , they responded very quickly and very very friendly. It is a few minutes drive away from the popular zonal hotelera, but the bus stop is not far and walking is another option , maybe 30 minutes? We loved the ocean view with balcony. It had a nice size fridge and all the utensils needed to eat in the room. We are a family of 4, with our kids being under the age of 10. They enjoyed the pool which is about 4 ft all around and it's easy access to the ocean. Bed and pillows where comfortable. Shampoo and hand soap is provided. We are not really a picky family, but if you are very picky there might be a few things that will trouble you.